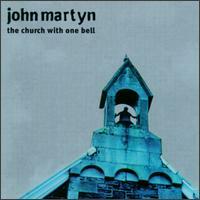 The Church With One Bell is an interesting covers album, finding John Martyn tackling songs that are both ideal and absolutely ill fitting. Since Martyn is such an idiosyncratic talent, maybe it shouldn't be surprising that he succeeds on "Strange Fruit" and not with Randy Newman's signature craftsmanship on "God's Song," but there's still a bit of shock that the former works. Furthermore, the choice of material is often puzzling, but he makes songs like Ben Harper's "Excuse Me Mister" work through committed performances. Ultimately, The Church With One Bell is too uneven to qualify as even a minor gem in his catalogue, but there are enough interesting moments to make it a worthwhile listen for long-term followers. The eagerly awaited cover-album was released on 23rd March 1998. Uncovering a whole generation of blues classics from Portishead's Glory Box to Billy Holliday's Strange Fruit, The Church With One Bell reverberates with John's vast musical talent. John is accompanied by John Giblin (bass), Spencer Cozens (keyboards) and Arran Ahmun (drums). The track selection was quite simple, when John and the band laughed, they chose that track - hard to imagine as many of the songs are not happy ! John's rendition of Glory Box stands out and other songs such as Small Town Talk, Strange Fruit, God's Song, Excuse Me Mister work well. On the other hand some songs just don't make the grade. This album enabled John to purchase the Church next door to his cottage where he know lives. The album was recorded in one week in Glasgow and was produced by blues producer Norman Dayron. Unlike many artists John doesn't just cover a song, he re-writes it and makes it all his own. Church received wide acclaim in the USA but unfortunately was less well received here. In time people will realise what a great album this is. Excuse Me Mister was released as a cd single with additional live tracks.